The last decade has seen a sharp rise in Islamic banking services, which are starting to offer a real and attractive alternative to the sort of financial services most people have grown used to. Across the Middle East, Africa, and Asia, Islamic banking has grown to become a prominent means of financial management, while it is also emerging in Western economies that have not typically been associated with it in the past. Islamic banking has fast gained prominence across the world. 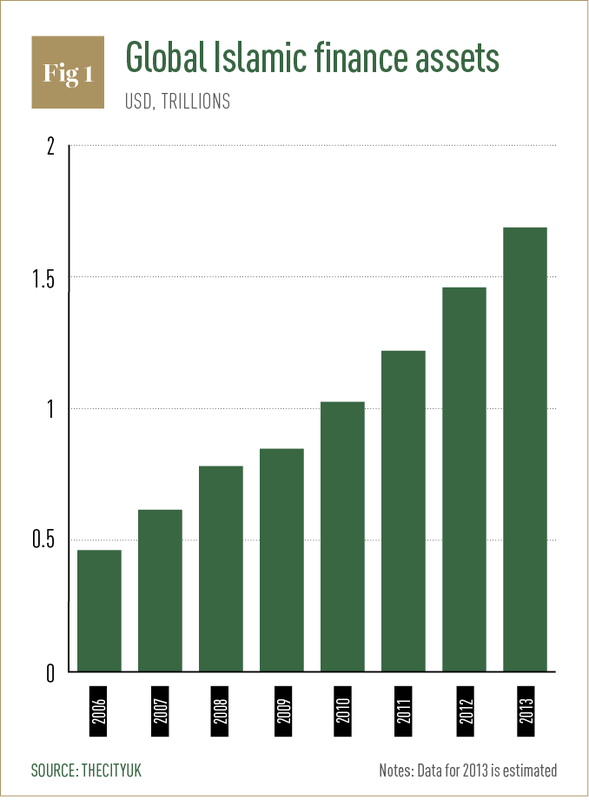 Globally, Islamic banking assets (see Fig. 1) were estimated at around 17 percent in 2013, while Islamic funds and sukuk led year-on-year growth with 14 percent and 11 percent respectively. Other key sectors of the Islamic economy have experienced success too. The global expenditure of Muslim consumers on food and lifestyle sectors grew 9.5 percent from previous years, and is expected to grow at a compounded annual rate of 10.8 percent until 2019. Global Muslim spending on tourism increased by 7.7 percent in 2013, while consumer spending on pharmaceuticals and cosmetics increased by two and one percent respectively. This global pattern of growth has been repeated closer to home in the UAE, supported by significant efforts by the UAE government to drive and consolidate the country’s Islamic economy. The UAE is among the top countries in global Muslim spending on halal goods, tourism and cosmetics. Islamic banks in the nation have been growing at an average rate of 14 to 18 percent in recent years, compared to four to eight percent for conventional banks. Clearly, the demand for an Islamic economy and Islamic banking is on the rise. Islamic banking is based on the core principles of sharia law and, owing to its principled approach and high value proposition, nevertheless, it has gained popularity beyond the market of practising Muslims. Islamic banking offers a plethora of products for customers or investors looking to participate. However, defined by a ‘real and rooted’ approach, with a focus on assets, it avoids the excessive complexity and ambiguity of some conventional products. For example, Islamic banking embraces risk-sharing as opposed to risk-transfer. In an Islamic finance (Islamic mortgage) and based on the Murabaha structure, the bank takes the responsibility of purchasing the item and re-selling it to the buyer at a profit. This arrangement enables the buyer to repay the bank in instalments. The bank protects itself against default by asking for strict collateral. This joint approach to financing protects the buyer and the bank – while still providing for both parties to benefit. In essence, the Murabaha structure compels the bank to take on and manage risk, while providing payment stability to the customer. Another example of risk sharing is seen in Islamic trade finance, where banks actually own goods in transit and have to insure against loss or damage. In addition, sharia law prohibits engaging in activities or transactions that are considered harmful to people, society or the environment. This ethical approach is at the core of Islamic banking and avoids transactions involving usury, interest, speculation, gambling, or industries contrary to Islamic values. So for investors that share these principles, irrespective of religion, Islamic finance provides a range of options. Islamic banking’s emphasis on shared responsibility and community also creates a more inclusive economy. For example, several Islamic financial instruments are designed to assist investors with ‘zakat’, one of the five pillars of Islam that mandates giving a portion of your wealth to charity. In addition, Islamic banks donate all late payment fees and forfeited income to charity. Islamic banks have no incentive for extensive or nontransparent fee charging, since they will not be allowed to recognise it as revenue. In addition Islamic finance has an ‘inbuilt anti-crisis mode’, which is perhaps one of the most compelling reasons why Islamic finance is so relevant to investors across the globe. For a world reeling from the after-effects of the global financial crisis, Islamic banking offers a steadier, safer approach. This is reflected in the in-depth screening process that eliminates companies deemed too risky because of excessive leveraging. The partnership structure of Islamic financing prompts both parties to be mutually responsible thus protecting individual investors. While profit is encouraged, it is just one of the reasons to participate in economic activity with community welfare taking equal, if not higher precedence. Money has no intrinsic value except as a medium of exchange and transactions have to be backed up by real assets and activities. Indeed, in the aftermath of the global financial crisis, many proponents of Islamic banking pointed out how institutions offering these services tended to be far more resilient to the crisis than those at the heart of the crisis. The IMF produced a report in 2010 that showed how Islamic banking institutions contained the fall out of the crisis by having lower leverage and no investments in risky, non-sharia-compliant products. Despite the growth of Islamic finance, there remain some hurdles to its growth. There is an urgent need to standardise sharia regulations and unify sharia rulings across banks and markets. Multiple interpretation of the law by sharia scholars can leave the industry as well as investors unclear about certain aspects of Islamic banking. In addition, there is a need for specific regulations related to Islamic banks against the current banking regulations being tailored towards conventional banking, i.e not taking into context the specific nature of Islamic financing. Islamic banks take on a higher exposure to real estate for example. There is also a need to differentiate Murabaha from normal lending as well as differentiate Musharaka from equity investments etc. There are several other challenges: liquidity management tools remain limited for Islamic banks, locally and globally. There is also limited consumer awareness of Islamic banks’ offering and on the overall competitiveness of Islamic financing solutions. In addition, Islamic banks still have to count on conventional banks for international market access/global deals. There are also limited sharia-compliant avenues across the globe. The debt markets remain dominated by conventional offering with limited sukuk and other sharia-compliant debt capital market instruments available. The Islamic economy is here to stay, and will grow to form a sizeable part of economic activity. We have already started to see signs of success, with Dubai being the third-largest sukuk venue globally, with $20.38bn in total value of sukuk listings. 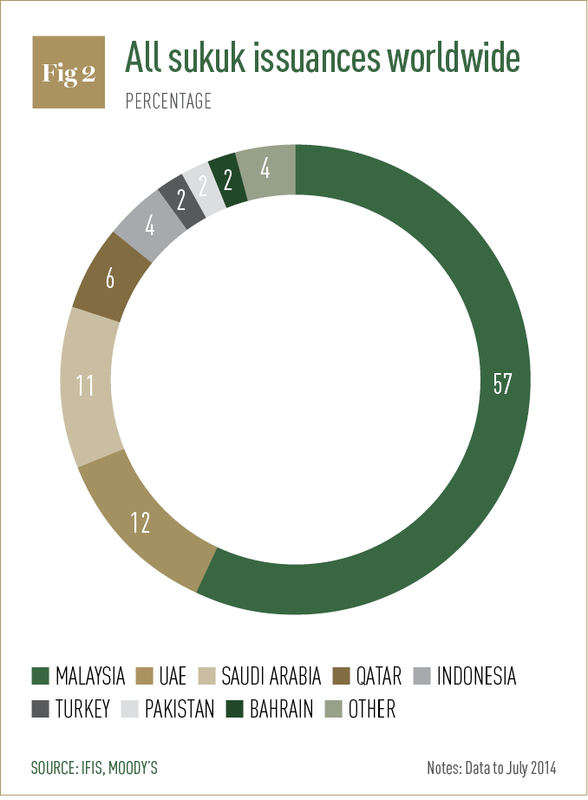 The UAE itself is second after Malaysia in sukuk issuances worldwide (see Fig. 2). Emirates Islamic has made significant contributions with the recent launch of the NASDAQ Dubai Murabaha Platform, a comprehensive Islamic Murabaha platform to provide local and regional banks with sharia-compliant financing solutions as part of Dubai’s Islamic Economy vision. Emirates Islamic also has a deep commitment to innovation in Islamic finance, by providing a range of segments, products and services, including customised solutions. The bank’s customer-centric approach, focused strategy and product innovation has also led to its expansion. In a span of a few years the bank has increased its customer base by more than 30 percent, developed and launched multiple products and services to every segment whether mass or niche, and grown its branch network by over 50 percent, making it the fastest growing bank in the UAE. Emirates Islamic has over 55 branches and more than 150 ATMs/cash deposit machines across the UAE – a testament to the growing demand among customers for a more ethical and transparent way of banking. Fuelled by such unprecedented growth rates, Emirates Islamic now stands as one of the three largest Islamic banks in the UAE, with one of the largest branch networks in Dubai. 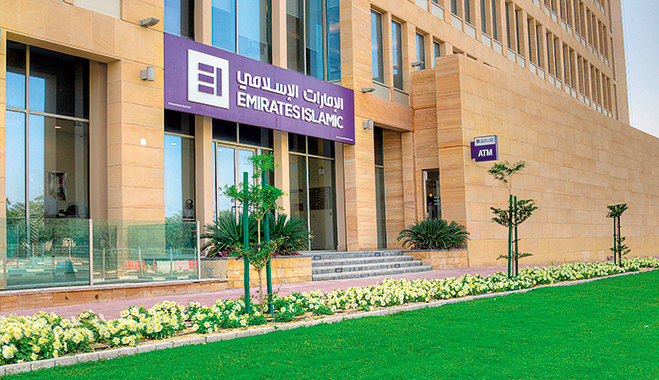 The efforts of the bank in recent years have been recognised by the general public and by prestigious publications – Emirates Islamic has received numerous accolades, both regionally and in the international arena, such as Best Islamic Bank, UAE 2015 by World Finance, Best Domestic Retail Bank 2014 by Islamic Business & Finance, and Best Corporate Bank 2013 by CPI Financial, among others. How will financial services evolve?